Mark Zuckerberg is the smartest social thinker I’ve met on my journey through life. He’s frequently misunderstood because he’s, well, generally too far in front of us. I remember meeting Doug Engelbart, the guy who invented the mouse (and showed it to us back in 1967 — way before Apple shipped the first consumer machine in 1984 that used it). Engelbart got kicked out of the research lab (SRI) where he developed the mouse because, well, his ideas were too weird for the time (Engelbart told me that he was kicked out because his fellow researchers couldn’t grok that everyone would have a computer in their pockets eventually). Zuckerberg will also be judged that way. He saw a world where everyone would need a social graph. I remember when people made fun of Facebook employees for saying that. But one thing I admire about Zuckerberg is he’s a great learner. When people bashed him for being too far out in front of us, he drops back and does what people want before pushing ahead again. Today is such an example. Zuckerberg understands that the use case of Facebook is for folks to talk to their PRIVATE families and friends. Most people who love Facebook are like my wife. Just want to talk to their friends and family and post a bunch of kid photos, or life photos. That user doesn’t understand, or care about, folks like me who want to build a public brand and find people around the world I don’t really know who are interested in the same thing I am. Yes, there are a lot of those out there, as this post on Google+ demonstrates, but most really don’t want to do that, they just want to talk to a small group of friends and family. I see this as my dad joined Facebook earlier this year. He doesn’t understand why anyone would use Facebook to talk to strangers or why anyone would want to post stuff to the public. Google+ users will recognize three of those features (the simplified “circles” UI, the nicer posted and shared with UI, and the profile preview one), since they’ve had them for six weeks. That’s why I like competition in this world, keeps teams motivated and working on making sure users don’t have any reasons to switch to each other (Editorial aside: Google will do well if it focuses on capturing the interest graph but will never capture the social graph — as long as Facebook keeps matching Google’s best features, like they did today, there’s no way most of its users will switch). So, let’s move through these new features and what they mean to users. This is my favorite new feature. I’ve been seeing spam on Facebook as people tag me in photos that I’m not in. This lets me be in control of what gets onto my wall. Here’s how. Each tag is held in moderation until I approve it. It’s easy to figure out and it’s easy to approve the tags I want to. 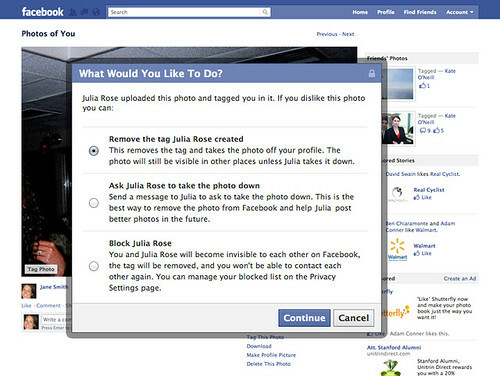 Even if you make a mistake and approve a tag that doesn’t make sense, or say, later you want to remove yourself from all of your ex-girlfriend’s photos or ex-wives’ photos, you can. Just go to the tag and click X to remove the link between you and her. This is far superior to how Google+ allows tags. For instance, here’s a photo I just was tagged in on Google+. Notice the complete lack of these kinds of controls. 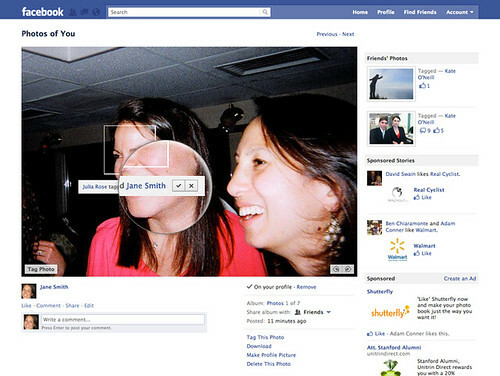 This lets you see what your profile looks like, to, say, your best friend, or some total stranger. That way you can make sure that your private photo of you getting drunk at that bachelor party last weekend actually is only viewable by your best friends and not by people you don’t want to see that photo, like maybe your boss or your wife. Those are the three screen shots Facebook shared with me. You’ll have to wait for the features to be turned on on your account (they say these features should roll out throughout the userbase “pretty quickly” — they didn’t want to give me an exact timeframe, since last time they announced major feature changes they took many weeks to hit all the users). But in my briefing they showed me a much simpler privacy page. Dramatically simpler. No longer do you have long lists, but just a few settings to figure out. Also, they showed me a page which is aimed at newer users, that will explain the consequences of each privacy page. So, add all these things up, and I’m sure lots of journalists will say that the threat from Google+ has been largely neutered because of these changes. That is absolutely true. Users are freaked out about privacy and, because of Facebook’s public image, many have spent a lot of time making sure that their accounts are locked down and that they aren’t sharing info to people who might be able to use that stuff against them. I think these settings may have the opposite effect. It might get Facebook users to relax a bit and start sharing SOME items with a wider group of people, which would improve that service a lot and could help it stave off the very real threat that Google+ does still represent: that some other company will build out the more lucrative interest graph before they do. But Google hasn’t demonstrated that it is able to keep up with the features of Facebook and it hasn’t turned on real-time search, noise filtering, sifting, or, tons of other features that are needed yet, so the race is on. Who will get there first? Google or Facebook? Today’s announcements show that the race is gonna be interesting at minimum.